He spent his childhood trapped within the confines of countless bizarre, strict rules. And lived to tell about it. In this first-hand account, author Matthew Paul Turner shares amusing-sometimes cringe-worthy-and poignant stories about growing up in a fundamentalist household, where even well-intentioned contemporary Christian music was proclaimed to be "of the devil." 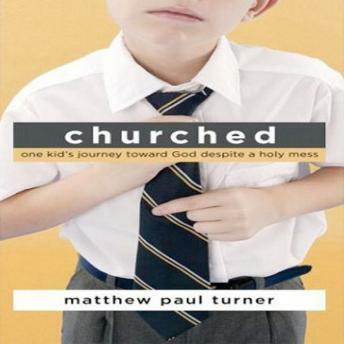 Churched is a collection of stories that detail an American boy's experiences growing up in a culture where men weren't allowed let their hair grow to touch their ears ("an abomination "), women wouldn't have been caught dead in a pair of pants (unless swimming), and the pastor couldn't preach a sermon without a healthy dose of hellfire and brimstone. Matthew grapples with the absurdity of a Sunday School Barbie burning, the passionate annual boxing match between the pastor and Satan, and the holiness of being baptized a fifth time-while growing into a young man who, amidst the chaotic mess of religion, falls in love with Jesus.